This Asian-style quick braise with peppers, onions, ginger, garlic and more is an excellent recipe for ribbonfish and any other fish or chicken too. My oh my, what big teeth you have. 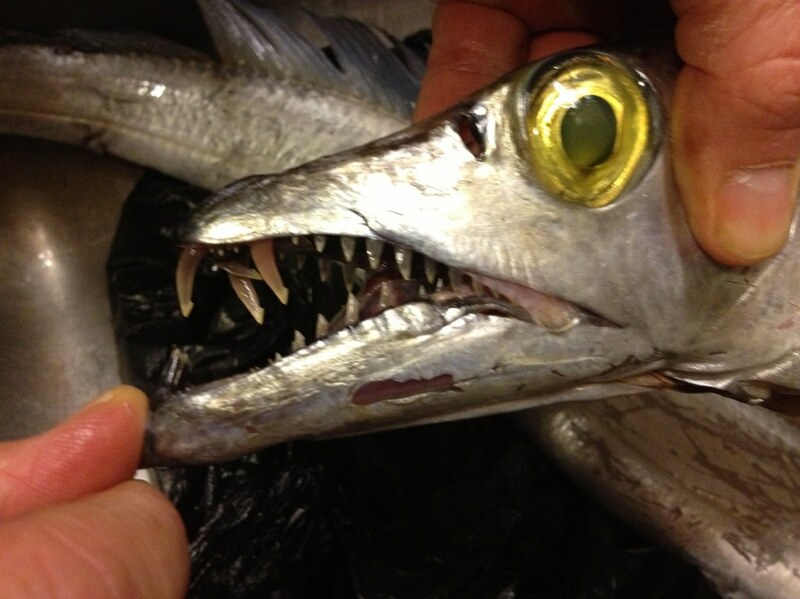 That frightening head belongs to the ribbonfish we ate last night. Here it is on ice. Ribbonfish (aka cutlassfish) is popular in Asia – the Pacific variety comprises the 6th largest wild marine fishery by weight in the world. But, it’s usually a by-catch here that’s either thrown overboard or used for bait. 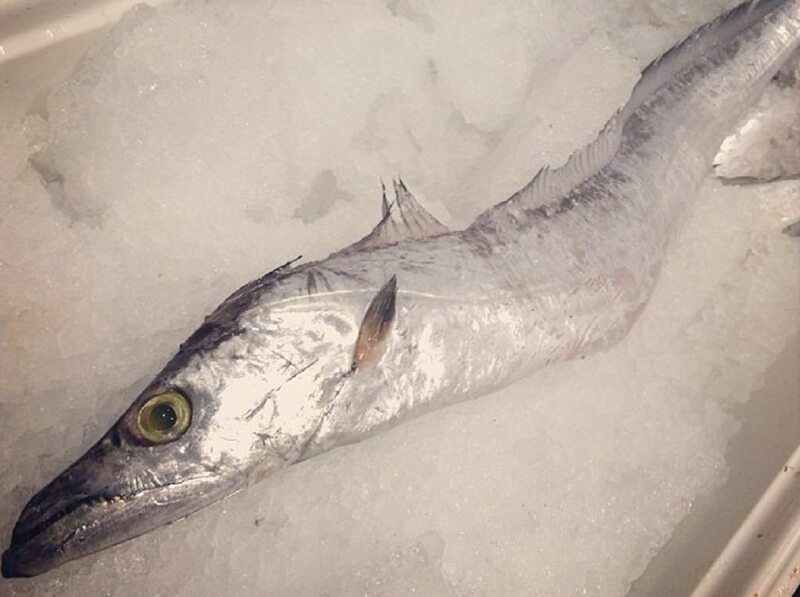 I had never seen or heard of a ribbonfish until a few weeks ago at Locals Seafood in the NC State Farmers Market. On the way to the market, I checked their Facebook page to make sure they were open and saw a link they posted to a ribbonfish recipe. I didn’t really read the recipe but the photo looked good and I had all the ingredients at home, so I took a chance and bought one pound of ribbonfish fillets. When I was ready to make dinner I went back to the recipe. Yikes, the instructions were written in non-native speaker English. It sort of made sense, but I wanted something better. I looked but really couldn’t find a good recipe, so I started with the Chinese-English one and came up with something that made sense to me. The first time I made this dish it came out surprisingly delicious. “Surprisingly” because I winged it. But, I forgot to take a photo. When I went to Locals Seafood on Saturday, they didn’t have any ribbonfish fillets – only a whole ribbonfish – that’s it in the photo above. My first reaction was “forget it, I’ll buy something else.” I suddenly realized — I don’t think I’ve ever filleted a fish before. Could that be true? How did I miss learning that when I was with McCormick & Schmick’s? I’m pretty sure that was part of management training. Maybe I’ve just forgotten. Those weeks of training are a crazy blur in my mind. The folks at Locals Seafood convinced me that it was an easy fish to fillet. And it’s about time I learn to fillet a fish – why should Jim have all the fun! Once home, I cut off the head and tail, and then cut the body in half. Jim showed me how to fillet by doing one side himself and then I did the other three sides. This time I doubled my recipe – we’ll have it again tomorrow night – and I took a few photos. I’ll never win any prizes for them but at least you now have a good recipe that’s easy to understand. I made cauliflower faux fried rice as a side and added some leftover green beans and chard. My advice to you: be adventurous, buy unfamiliar local fish and learn to fillet too! If you’re more in the Italian mood, check out my recipe for Ribbonfish Puttanesca. You’ll need a large pan with lid. Heat a few tablespoons of oil in a large pan. Spread out the cornstarch on a plate. Dredge the skin side of the ribbonfish in cornstarch. Shake or wipe off any excess. Sauté the pepper and onion until softened. Add ginger and garlic and sauté until the garlic begins to golden. Add soy sauce, vinegar, brown sugar, chili sauce and chicken broth. Bring to boil and cook about a minute, or until sugar is dissolved. 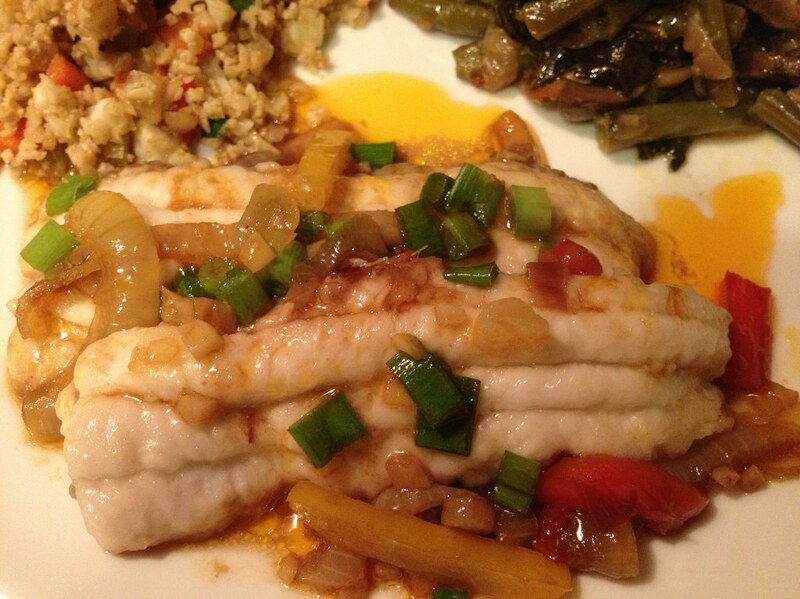 Add the fish, skin side down, cover and simmer on low or medium-low for 5-10 minutes or until fish is cooked. Taste for salt and add if needed. Sprinkle with black pepper and scallions. Keep warm until ready to serve. Looking for something a little bit the same, but different? Try Salmon and Vegetable Stir Fry. You’re welcome, Carson. When I first started buying ribbonfish from Locals Seafood, it was tough to find a recipe, so I’m glad I could come to the rescue. I also have a ribbonfish puttanesca recipe here too — do a search or click the “ping back” link above.